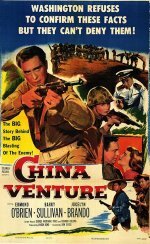 Don Siegel directs this movie about a behind-the-lines operation in World War Two China competently but not particularly interestingly, with a air of post-war anomie. An excellent cast, including an improbably present Jocelyn Brando ("Just treat me like a man") is directed for speed. Edmond O'Brien's emoting is so subtle as to be monotonous -- apparently everyone is supposed to be utterly war-weary and only surviving through sheer competence.